Hey friends! What’s up? Are you hiding under the blankets and waiting for spring or are you enjoying autumn and the darkening days to the fullest? I’ve been both enjoying the pretty colors outside and hiding under the blankets, especially on super gray and cold days like the ones this week. But mostly I’ve been just staring at my screen and working on my next book… a.k.a my Master’s thesis! So exciting. Or not. So things are not that glamorous here at the moment (and definitely not as delicious as working with N’Ice Cream book!) but in order to procrastinate get through this project, I’ve been making all sorts of things in the kitchen. Somehow it seems that my mind is flooded with recipe ideas just as I’m supposed to be focusing on self-determination theory or something other important. So here’s one of the things that has been going around in my head for a while: Blended Wild Blueberry Porridge! This is actually a re-make of a Finnish classic, Whipped Lingonberry Porridge, but instead of using a stand mixer I just blended everything and used blueberries instead of lingonberries. The classic version is also made from semolina, so to make the porridge gluten-free I used gluten-free oat and buckwheat flakes. And I really loved this version! It’s very creamy and makes me feel nourished, it’s super easy to prepare and it tastes great both warm and chilled. I like to enjoy it warm in the morning and then have the cold porridge with some fruit or berries as an afternoon or evening snack. So the recipe makes enough for a couple servings, which is great! What else? There’s a new recipe archive! Now all the recipes have a small thumbnail and they’re divided into different categories. You can also search recipes by typing to the search bar or by choosing a tag. I also added a new vegan category where you’ll find all the vegan recipes on the blog. I hope you like the new archive and feel free to share if there’s something weird or something’s missing! notes: this porridge is great both warm and cold so it’s perfect as an afternoon or evening snack too. try adding some nut butter to make it even more creamier or sweeten it with dates! 1. 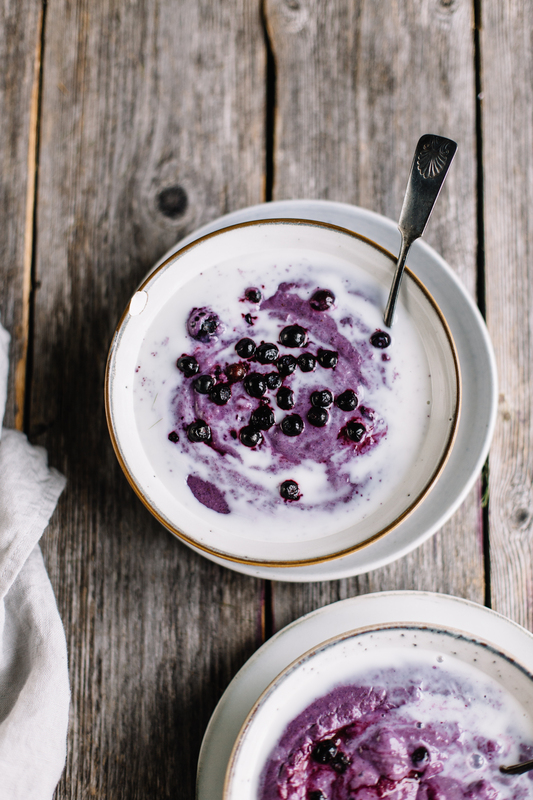 Add oats, buckwheat, blueberries and cashew milk to a blender and blend until smooth. Transfer to a pan and bring to boil on medium heat, stirring constantly so that the porridge doesn’t get burned. Stir for about five minutes, until the porridge has thickened. 2. Take away from heat and mix in the salt, vanilla, cardamom and honey. Taste and add more sweetener or spices, if desired. If the porridge is too thick, add a bit of milk. 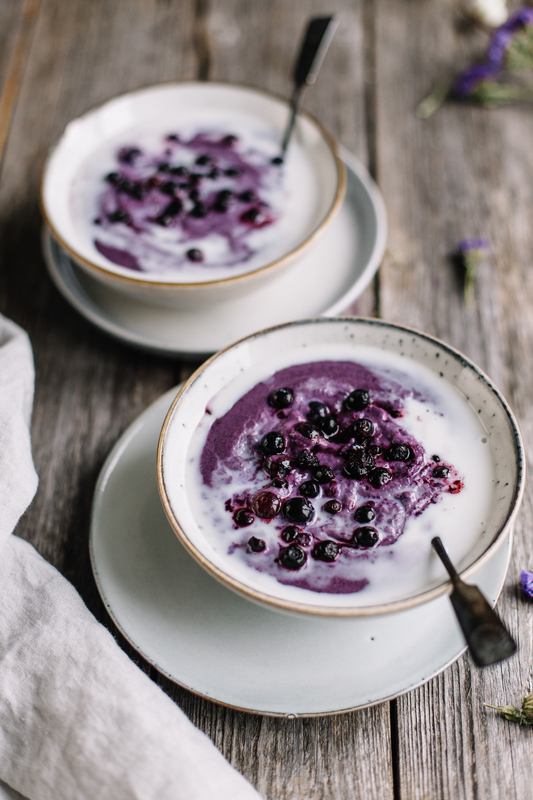 Serve warm or cold with some extra blueberries and cashew milk, and enjoy! Store leftover porridge in the fridge for up to two days. Tagged autumn, berries, blueberry, breakfast, oat, vegan. This Super Veggie Pizza w/ Sweet Potato Crust will turn any leftover veggies into a delicious pizza! And as a bonus, the crust is made in the blender! Btw, I’ve been checking the new archive and let me tell you it’s awesome. Never seen a blog with an archive as easy and interactive as yours. So easy and quick to find any recipe. Congrats! Thanks so much Gemma for letting me know, I appreciate it a lot! <3 And the purple color truly is divine, right? It cheers me up on these grey days! Have a lovely week! xo's! 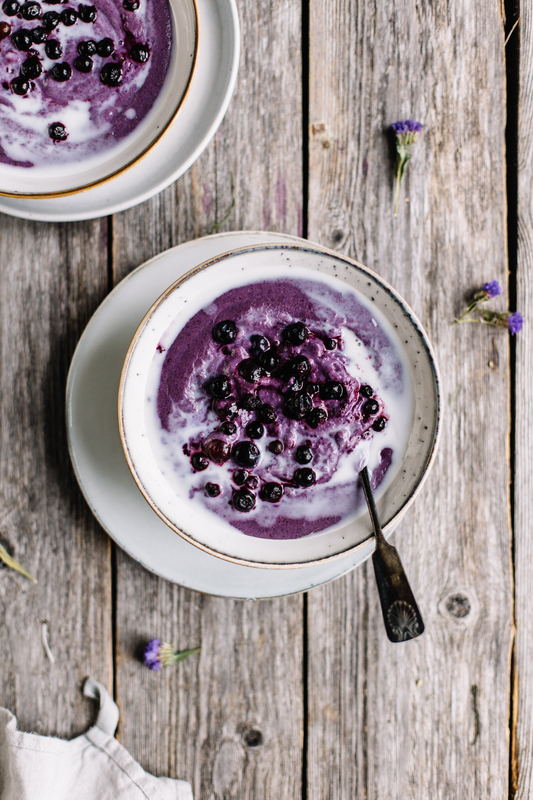 This porridge looks absolutely delicious and your pictures are gorgeous! 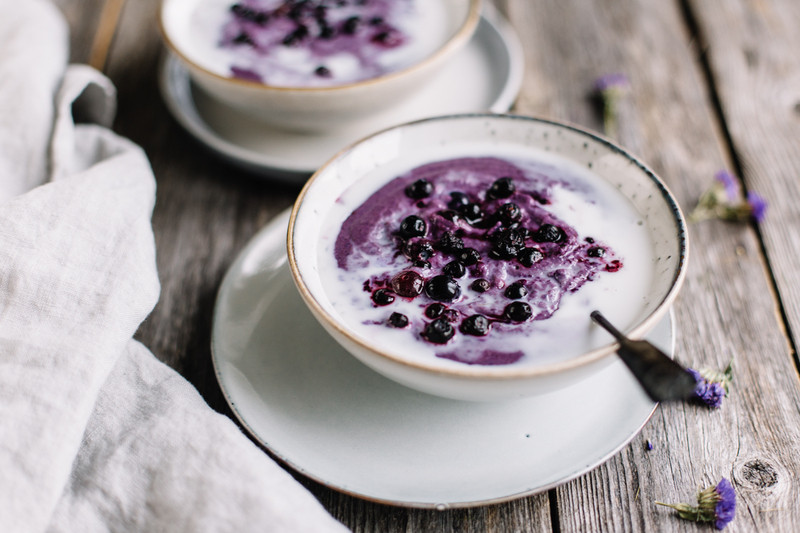 I think I’ll make this porridge using my homemade coconut milk, since I just love blueberries and coconut together. One question, I don’t have or know where to get buckwheat flakes. Do you think I could used soaked raw buckwheat in place of the flakes? Thanks, looking forward to this. Can I substitute the buckwheat flakes for something else? You could use millet flakes as well!